Preparing for baby can be quite overwhelming. There are so many products marketed towards new parents and it can be hard to know what is necessary. One of the things we knew that we would absolutely need was a baby monitor. John is most definitely the technical expert in this house, so we decided he would research different options. I ended up getting a head start on things and discovered a lot of great options. One monitor that consistently came up on all of the "best of" lists was the Infant Optics DXR-8. Not only was it an affordable option ($166 via Amazon Prime), this monitor has a 4.5 rating with nearly 12,000 reviews. The more I looked into it, I was sold. John ended up buying it without doing his own research, which was a bit scary. I don't know about these things and was worried that I may have made a bad choice. Luckily, that didn't end up being the case and John gave me props for finding such a fantastic option! Infant Optics is a newer company, having started in just 2011. That certainly doesn't mean they don't know what they are doing! They specialize only in non-WiFi baby monitors, which means that the audio and video are never online. 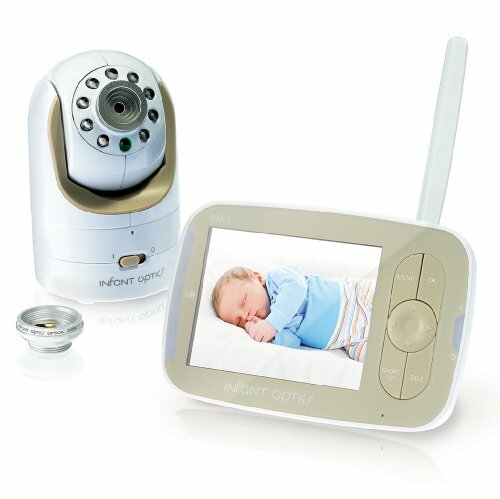 The DXR-8 is the first baby monitor with an interchangeable lens - it comes standard with both a normal lens and the optical zoom lens. The normal lens provides a clear image with mid-range coverage. The zoom lens is best for close-up viewing, even if the camera is far from baby. We chose to purchase the wide angle lens, which was not included with the original purchase (but was very reasonably priced - just less than $12 on Amazon). This lens shows the entire room with a full 170 degree panoramic view. The monitor has a long battery life (up to 10 hours) and can be charged via USB cables. The set-up couldn't have been any easier, which is something that really sets this monitor apart. It is basically just "plug and play," which is awesome! John mounted the monitor on the wall above the crib because it gives us the best view down onto baby while she sleeps, but we can also see the rest of the room by tilting or panning the camera (which is silent, by the way). The monitor itself is very user friendly. The menu is easy to navigate and you don't need a tutorial to figure things out. I like that you can turn down the volume and that there are sound activated LED lights that allow you to see if baby is crying. If you want to save power, you can turn the screen off and just play audio. Also, it has great range. John was worried because at times we have issues with our Wifi coverage in different parts of the house and he is in the process of researching a replacement. Great thing is that this monitor isn't using WiFi, and we have no issues getting continuous service - even in the backyard! Our only criticism is with the placement of the plug-in jack. It's in a bad location when you are mounting it on the wall, but wouldn't cause any problems if you just place it on a dresser or shelf. Overall, this was a great purchase and we are very pleased with the DXR-8. We couldn't have found a better value for something that provides everything we were looking for safety and security wise. There are many reasons why this is a #1 best seller on Amazon and it's incredible that this monitor continues to rack up so many positive reviews. I've read that their customer service is fantastic as well, which is very important. Hopefully we will not have to deal with them, but I feel better knowing that they stand behind their product and are willing to help make things right when they go wrong. Whether you are expecting or already have small children - I can't recommend the DXR-8 enough, especially if you want something that is easy to set-up, easy to use and doesn't take a tutorial to understand!